It's hard to believe that it's almost the end of March. Where has the time gone? It's been a crazy winter here in the Lower Mainland of BC - lots of snow and cold. We're just not used to that. I think that we're back to normal now with rain and maybe spring is on the way. I was at a crafting retreat on the weekend and decided I needed something to brighten up my house. I've been seeing all of the amazing succulent creations on Pinterest and had watched a video on how to make a live succulent garden. It was that video that inspired this project. This project was really easy. 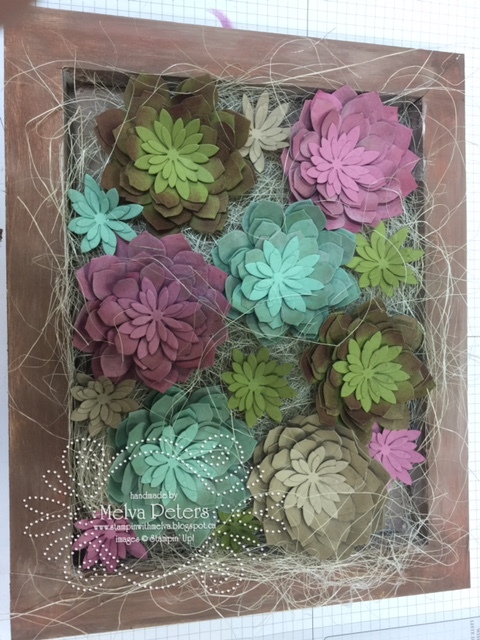 The work is in the cutting out using the Succulent Framelits Dies (Item 142757). You need 9 pieces for each of the large succulents - 2 of each of the large pieces and 1 each of the small flowers. For the small flowers, I cut 1 of each size per flower. Once you have them cut, you can sponge with different colours. I didn't sponge the small flowers. The base is a wooden artists pallet I bought at the dollar store and painted with acrylic paints and filled with basket filling. You could use sphagnum moss as well. It was so much fun to put this together! Interested in attending my class for this project? I'm holding a class where you can make this project on April 23rd at 1pm. Cost is $30 and includes all of the materials you'll need. You need to pre-register by April 16th so that I can have your kit cut. Register by visiting my FaceBook page or by visiting my Blog and clicking on Classes and Events.